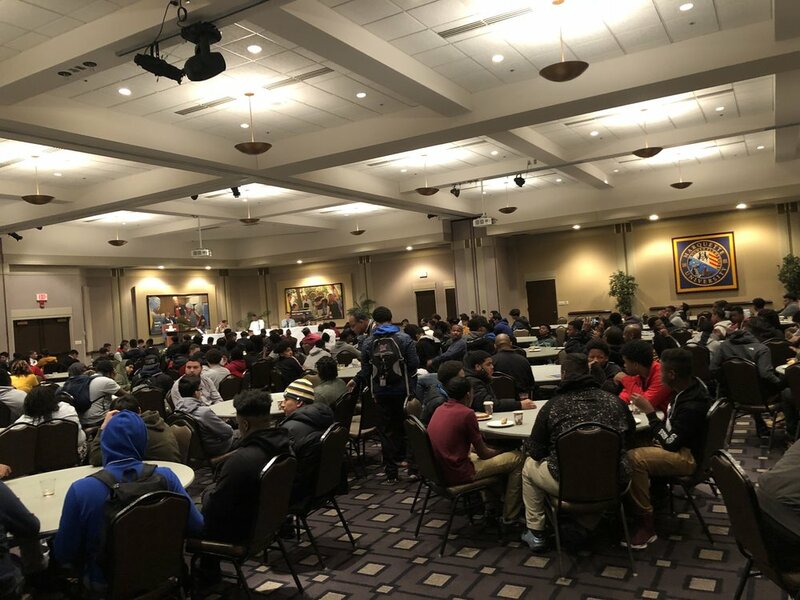 Young Local Black and Latino Men Come Together to Attend Leadership and Brotherhood Summit — Carvd N Stone Inc.
What does it mean to be a young man of color in one of the most segregated cities in Milwaukee? To most, it means being marked as a criminal for just existing. It means being harassed by the police for looking suspicious, even when you’re just walking down a block. It means dealing with the media portraying a demonic image of you for all of the world to see. It means all of that plus more. Being a young man of color isn’t something that can be easily defined because not one experience can tell the stories of thousands of individuals. For the first time ever, Marquette University and Black and Latino Male Achievement (BLMA) teamed together to make inaugural Leadership and Brotherhood Summit for Young Men of Color a possibility. BLMA is a department of Milwaukee Public Schools (MPS) that addresses the disparities facing young Black, Brown and Latino men of Milwaukee. Director of BLMA, LaNelle Ramey said since their a part of MPS, they reached out to MPS schools their partnered with to invite their students to the summit. Majority of the students came from MPS, but there were a few from Carmen, West Allis and Wauwatosa West who attended the summit as well. A few of the schools saw what MPS and Marquette were putting together and asked to send a few of their students to attend, and they were welcomed with opened arms. Marquette University hosted the event, which was held earlier this morning into early in the afternoon. The summit served as a place for the students to open up and share their experiences with one another, without judgement. The images the media portrays of our young men of color has to change, and this summit is letting these students know that they can be more than what they see or hear from the world. Teaching our young men their true powers and worth is stronger than any negative image the media spurs out. Latrice Harris-Collins, Director of High School Recruitment, Office of Undergraduate Admissions for Marquette, said this summit is to show our young men of color that their are people like them that are leaders and have power. “Giving these young men some substance,” she said. “To show some love to our students,” was one of the main goals of the summit. Young men of color are forced to be on the defensive side most of their lives because of the many forces being thrown at them. Yet, their expected to take it all without any complaints, or they will face consequences. This summit changes the narrative by showing and letting these young men know there are people right here in the city that cares about their well-being and future. President of the Milwaukee Common Council Ashanti Hamilton—who just filed his papers to run as mayor—looked around the room in amazement at what he saw. As a Milwaukee Public School graduate, he knows the struggle of making it out. These young men face hate, bigotry, racism, police brutality, etc. To too many on the outside, these are just a list of words, but to the individuals experiencing these issues, they are facing traumas they don’t know how to address. By BLMA and Marquette teaming together, these young men are seeing first-hand what it looks like to be a person of color and be successful from people who come from the same neighborhoods they live in. The day consisted of panels, discussions and just real connections between everyone involved in the summit. Junior of Marquette, Richard Nwabuzor was a part of the student-panel, where each panelist discussed their experience at Marquette. Nwabuzor said this summit is an opportunity to see the real college experience that college visits can’t give. The summit puts the students directly in contact with current Marquette students, staff and alumni and other resources to show them that college is feasible. “It’s a way for us to learn all of these skills and bring it back to our communities,” he said about attending college. “To uplift them.” But, he did state that college isn’t always the answer. To find out more about Black and Latino Male Achievement and their many initiatives to improve the lives of Milwaukee’s young men of color, click here.